Part 2 of the series discussing the fundamental principles of Vedic Jyotishya. १. वैदिकपरम्परायां सूक्ष्मस्य कालस्याऽपि गणना प्रचलिता न वा ? २. छायापरिमाणाद् कथं शुद्धं सौरमयनं ज्ञायते किमर्थञ्च तदुपदिष्टम् ? In this second part of the series on Vedic chronology, we will discuss the ancient units of time along with water clock, method of identifying muhurtas of the day and solstices by measurement of shadow and method of insertion of intercalary month (Adhikamasa) in Vedic system. As Adhikashadha (Second Ashadha/ Intercalary Ashadha) according to Vedic system starts from May 26, we will discuss about the research finding put forward in commentary of Vedanga Jyotisha (VJ) (6) on correct way of insertion of such intercalary month in detail. As we introduced in the first article of this series, in Vedic tradition exact solstice and equinox days were observed by various methods as pointed out in VJ and other ancient texts. As the winter solstice day (Solar Uttarayana day) was defined as the day from which the day starts to lengthen and night starts to shorten by a Prastha each day, let us discuss in detail about the method of keeping time where water clocks were the principle instruments used and time was measured in terms of water volume. Let us first see the units of time used in Vedic tradition. How small was the measurement of time in Vedic tradition? In Shatapatha Brahmana (12/3/2/5), we can find a description of a very small unit of time called Nimesha. Prana and Ana are synonyms of Nimesha. Ten thousand eight hundred are the Muhurtas in one year (Taking Savana year of 360 days). Fifteen times more are Kshipras in one year. Fifteen times the value of Kshipra are Etarhis in one year. Fifteen times the value of Etarhi are Idanis and Fifteen times the value of Idani are Pranas/Anas/Nimeshas in one year. Such description of water clock can be found in various Puranas as well with similar parameters. The 15 divisions of a day called Muhurtas were also used to be determined by measuring the length of the shadows as described in the next section. Why time to time observation is necessary to determine solstices and equinoxes? Many renowned authors including Bal Gangadhar Tilak and Shankar Balakrishna Dixit ( 7,8) have mistakenly concluded that there was no knowledge of precession of season in Vedic tradition without examining the details. One major basis for this misconception is the seventh verse in VJ where the term sada (always) has been misinterpreted to mean that Uttarayana always begins when the Sun reaches the starting point of Shravistha (Dhanistha) Nakshatra and Dakshinayana always begins when it reaches to mid-point of Ashlesha Nakshatra; concluding that there was no knowledge of precession of solstices or season at that time. But this term is actually intended to mean that the months where soni-lunar Uttarayana and Dakshinayana begin should always be called Magha and Shravana respectively. The internal evidence is the definition of Solar Uttarayana itself, which was discussed in detail in the first part of this series. One point that needs emphasis here is the details other than the basic theory given in currently available versions of VJ (both Yajurvedic and Rigvedic) were meant for particular time and clearly state that whatever is explained therein is only to set example and repeated calculations should be done based on new data for instantaneous calculation as explained explicitly in the 42nd verse. If the structure of VJ is examined in the light of the Vedas themselves, it becomes clear that the compilation of VJ is based entirely on the Vedas. As we discussed in the first article though the names like Magha, Shravana are derived from the Nakshatras, they have to be used as synonyms to the season based names i.e. Tapas, Nabhas, etc. as it becomes clear from their use in Brahmana part and Samhita part of the Vedas. The definition of the solar Uttarayana based on increment of day light itself is indirect evidence of the knowledge that it needs to be observed as it can shift slowly so that just counting the day from a known point is not adequate. Direct evidence of knowledge of precession is from Maitrayaniya Aranyaka (6/14) which states that Uttarayana starts when the Sun reaches middle of Shravistha (Dhnistha) in contrast to the current version of VJ stating it to begin when the Sun reaches to this Nakshatra. 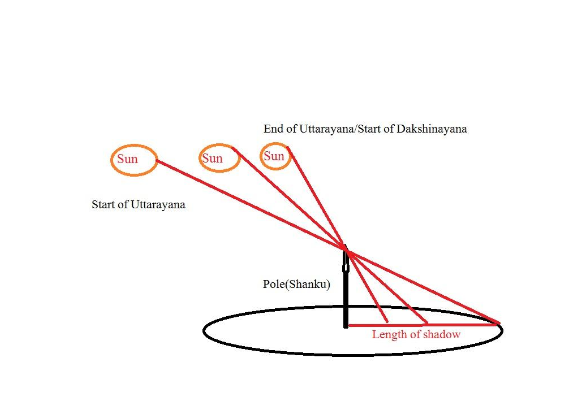 In Kautilya’s Arthashastra detailed description of shadow length for identifying time has been given: “When the length of shadow is eight paurushas (96 angulas), it is 1/18th part of the day. When it is 6 paurushas (72 angulas), it is 1/14th part of the day; when 4 paurushas, 1/8th part; when 2 paurushas, 1/6th part; when 1 paurusha, ¼th part; when it is 8 angulas, 3/10th part (trayodasabhagah); when 4 angulas, 3/8th part; and when no shadow is cast, it is to be considered midday. Likewise when the day declines, the same process in reverse order shall be observed. As the length of shadow in midday varies with latitude, the implied meaning of no shadow should obviously be understood as shortest shadow which signifies the end of pure solar Uttarayana in northern hemisphere. How the Vedic system of insertion of intercalary month (Adhikamasa ) is different from current practice ? Describing the genesis of intercalary month (Adhikamasa), VJ verse number 37 clearly states that it can occur at the middle or the end of a Yuga (i.e. occurring at the end of either of the Ayanas). This statement has been creating a serious debate since long with the interpretation that there are always two intercalary months in a Yuga of 5 years (each after two and half years /30 months) in Vedic system according to this verse, which causes accumulation of discrepancy in solar season and lunar months in long term. Famous astronomer Venkatesh Bapuji Ketakar in his work “Indian and foreign chronology” in his attempt to to solve the problem gave his hypothesis: “An intercalary month is to be inserted every 30 months till 5 and half yugas (27.5 years) and omitted it at the end of sixth yuga, but not omitted it at the end of six centuries” (9). But, unfortunately, this hypothesis is not backed by any evidence and does not help in solving the mystery. Thus, this question remained unsolved probably since more than 1000 years, till Kaundinnyayana commentary on VJ solved it with research findings from ancient unpublished material which clarified actual practice on correct way of insertion of AdhikamasaI, according to ancient method as intended in VJ. As Vedic scholars used to observe true solstices and equinoxes (as explained in previous part and above) to decide the start of Year, Ayana etc. rather than just depending on mere calculation, like many of other measurements and statements, this statement is also to be taken as a general statement. It can also be interpreted as basically intended to emphasize the insertion Adhikamasa in middle or end of the year (i.e at the end of either of Ayanas). Practice of observation does not allow accumulation of error unlike practice depending just on predetermined rules or values. On the basis of explicit statements made in unpublished manuscript of a Dharmashastra collection known as Ratnakarandika, authored by a scholar named Drona, preserved (Microfilm reel No. B 33/12) in Kathmandu based Rastriya Abhilekhalaya (National repository of documents) the problem is now solved in the commentary. The verse that clarifies the exact rule for practical use states that when the Sun starts to move towards south (i.e. occurrence of summer solstice day) after Dashami of Krishna Paksha, the month is second Ashadha or intercalary Ashadha month. Similar rule is applicable for insertion of intercalary Pausha month as well. This rule does not result in insertion of intercalary months every 30 months ( i.e. 2 such months do not occur in all Yugas of 5 year duration) solving the problem of accumulation of discrepancy between solar season and soni-lunar year, Ayana and season. 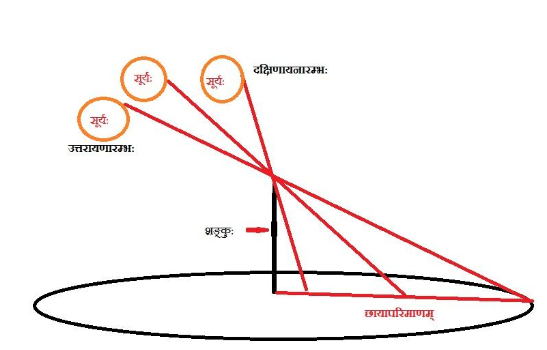 We know that this system of calculation of Adhikamasa was in practice till 16th century in Nepal as it can be seen in the inscriptions and manuscripts from Licchaavi era (spanning from 500-1600 Vikrama era) instead of Rashi(Solar month) based calculation. Some of the inscriptions from Nepal with dates containing Prathama Ashadha ( first Ashadha i.e. Ashadha month preceeding intercalary Ashadha) and Prathama Pausha can be seen in the collection of Nepalese Inscriptions published with English and Hindi translations (10 ). This points to the fact that the Lichchhavis who are known to have come from Vaishali to Nepal carried the Vedic system of intercalation with them and kept on using it when the newer Rashi based definition had almost replaced it in other parts of Bharatavarsha. This original Vedic system has to be revived and used in practice by followers of Vedic tradition, which will be possible by including them in Panchangas. In next article in this series detailed account of currently available version of Vedanga Jyotisham will be given. Kaundinnyayana, Shivaraja Acharya. Yajusham Vedanga Jyotisham with Kaundinnyayana and Somakara’s Sanskrit commentaries and Hindi translation. Chaukhamba Vidyabhavan, 2005. pp 354-59, 396-412. Dixit, Shankar Balakrishna. Bharatiya Jyotish, Hindi translation Third edition Hindi Samiti Uttar Pradesh 1975. pp130-31.